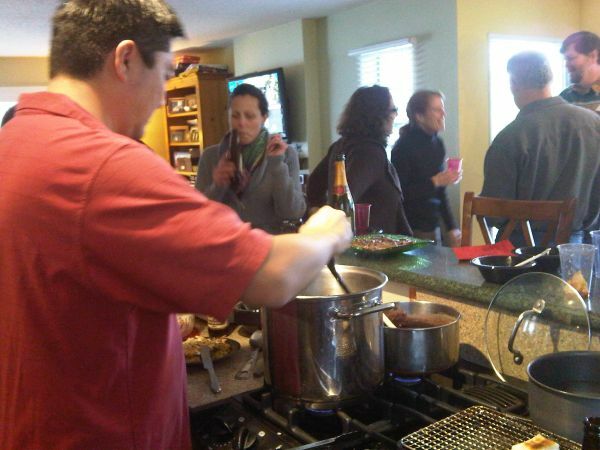 But the big event is the chance to eat George’s special “Good Luck” New Year’s soup. 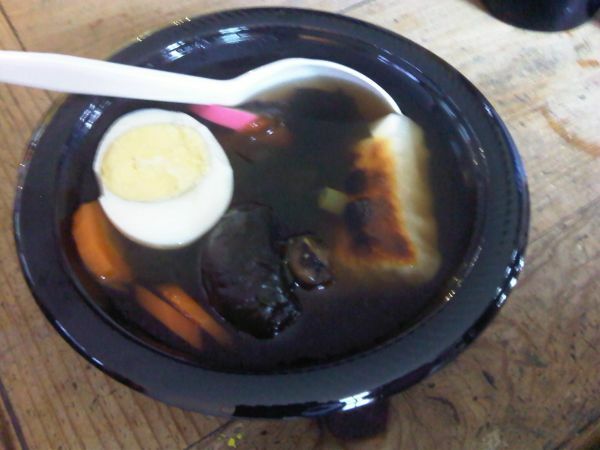 As people mingle and sip and nosh, George hunches over his big pot of soup, It’s slow going: he has to grill a mochi, then cook it in the broth carefully before slipping it into the bowl, along with sliced carrots, a hard-boiled egg, chopped chicken and some kind of seaweed. Only when he’s carefully assembled all this will he bring you your bowl. And everyone who enters wants a bowl. Everyone agrees that 2009 was not a great year. Everyone hopes 2010 has to be an improvement. And everyone believes that every little bit helps, even if it’s a soup. So I asked George this year to explain to me the significance of this Good Luck soup. “Oh, there’s great significance,” he tells me gravely. “Go on…” I say, hoping for some ancient Japanese wisdom, or at least a rare family recipe. “Is he making this up?” I peer at Dr. Ash, standing next to him, who starts laughing first. Usually the English can keep a straight face longer than anyone. So there’s no old family recipe or any particular significance behind this soup, I say. It’s all hype. I could only eat half my bowl of Good Luck soup. I had already filled up on Okonomi-yaki, which is a popular dish in Osaka, and frankly, one bite of the dense, chewy mochi dumpling in the soup topped me off for good. I’m gonna take him on his word on that on.